When out mountain biking, nothing is more important than ensuring your safety and the safety of others around you. The truth is, mountain biking is one of the most enjoyable activities in the world, but it can present several hazards above and beyond those of road cycling. If you’re ill equipped to foresee them, you could find yourself in harm's way sooner than you think. Below, we have listed seven points that you must always remember before heading out on a mountain biking adventure. Wearing a helmet while mountain biking is a no-brainer (which, interestingly, will be the state of your head if you don’t wear one). The chances of you falling off your bike is increased dramatically when mountain biking due to unexpected rocks and loose surfaces. There is no excuse for not wearing a helmet. However, more than just wearing one, you’ll have to ensure it fits comfortably while still being tight enough around your chin so to ensure ultimate protection. You can choose how far you want to burrow down the rabbit hole in terms of cycling shorts, gloves, and shirts, but at the very least make sure you take weather appropriate clothing with you. You know your routes better than us, so we’ll leave precise clothing decisions up to you, just be sure to always have a rucksack with you in which to keep extra clothing, suncream, and a small waterproof poncho. We’re not implying you should not try to push yourself to achieve more. We’re just saying that you should not go all in on your very first mountain biking session. You will need to train your fitness level to increase it bit by bit over time so you don’t damage your body in any way, either through exhaustion, or falling from your bike. Increasing your fitness level over time will help improve your core fitness and make you a stronger rider than had you jumped right in at the beginning. Many mountain biking trails are enormous. That is why you should keep your mobile phone or GPS device on you at all times so to keep tabs on your location. Be aware that, depending on where you are, there’s a high chance you won’t have any coverage for large portions of your journey. Therefore, ensure you have a physical map on hand at all times. Always check your brakes extensively before heading out on a mountain biking adventure. In certain circumstances, having properly working brakes can mean the difference between life and death. Afterwards, check your bike all over, focusing on the tyres, pedals, and chain, to make sure they feel solid and ready to roll. You don’t need to know everything, just get the basics down so you can perform first aid either on yourself, or a member of your group should you need to. When mountain biking, you’ll likely come up against a lot of opportunities to collect scrapes and cuts on every trip, therefore a basic first aid course can pay for itself very quickly. 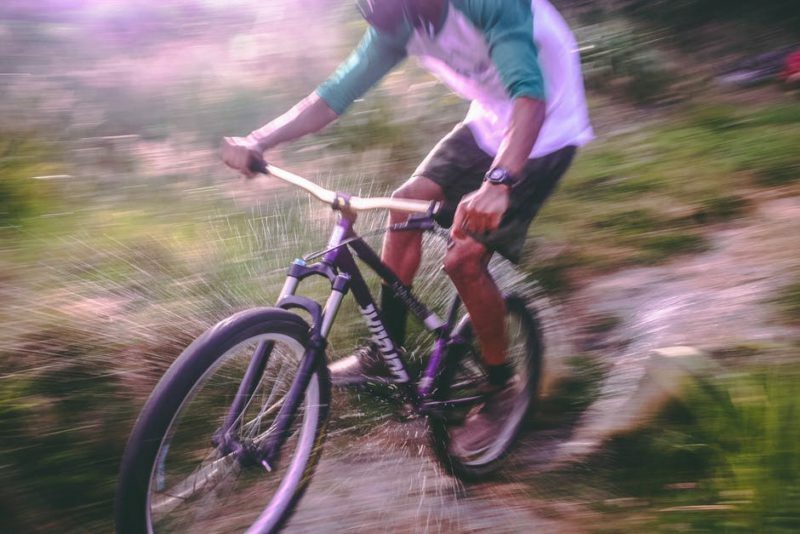 The faster you ride, the less time you will have to react to an unexpected rock, root, or anything else in your path that could lead you to crash into the nearest tree. Riding slowly is especially important if you’re new to the trail, as you will have no idea what is coming up around the next corner. Stay safe, and slow down.